Two suspects who have been charged with premeditated murder in the deaths of two British tourists on Koh Tao Island in Surat are from the Arkanese town of Kyaukpyu in Myanmar. They were charged September 15. 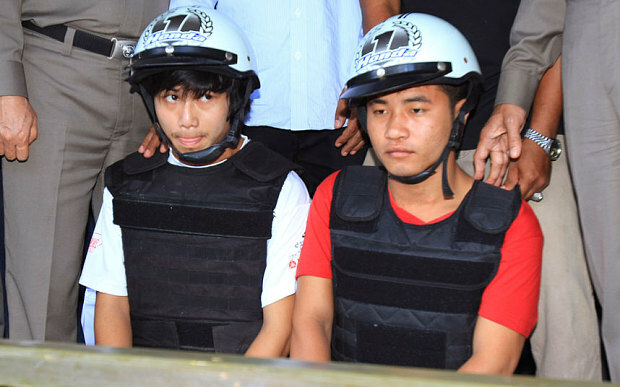 Win Zaw Htun and Zaw Lin, both age 21, were arrested after weeks of pressure on local authorities to solve the case that dealt a significant blow to tourism in Thailand. The nation was already struggling after an army coup and the imposition of martial law in May. Amnesty International, a human rights group, called on authorities in Thailand to launch an investigation into allegations that the police tortured the two suspects who are reported to have confessed to killed the British tourists. One of the suspects alleged that police “beat and threatened him with electrocution”, according to a lawyer from the Myanmar embassy who was cited in comments by Amnesty International. The group also indicated that multiple sources had reported torture acts and other types of cruel, degrading and inhumane treatment of others from Myanmar who were working in Thailand and were arrested in connection with the same investigation. Thailand’s national police leader Somyot Poompanmoung called a press conference in Bangkok aimed at putting an end to allegations on social media and other speculation that his officers framed the suspects and used them as scapegoats for solving the lingering case. David Miller, age 24, and Hannah Witheridge, age 23, were found dead on a rocky shoreline alcove close to a hotel at which they were both staying. Autopsies indicated that the female died of head trauma while the male took several blows the head and then drowned in the surf. The reason for the killings remains unknown. The island known for its popular dive sites and quiet beaches is 410 kilometers south of Bangkok.